Campbell Street Bicycle Shop: Another bike on Sale! 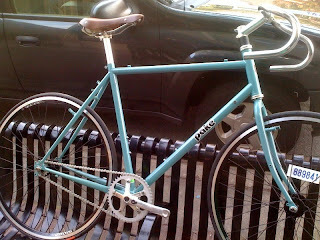 What we have here is a 56cm Pake C’Mute Frame and Fork in a lovely Mint color. This frame is a do it all frameset, it has horizontal dropouts, a rear derailleur hanger, Braze-ons for water bottles, racks and fenders, it also has brake studs for vee (or canti) brakes, It’s made of Tange 4130 CroMo Steel, so you know it’s durable, it’s based on a Cyclo Cross Geometry. Sorta a jack of all trades bike. Tour, Commute, or just ride. We will sell the bike as it’s built for $800. And the wheel set for $300. Or any combination of that, I’m flexible so give me a call or an e-mail and we can talk. This price is pretty firm, it’s a darn good deal.